While wandering around on the world wide web I ran across a few different ideas for geodesic structures including greenhouses. 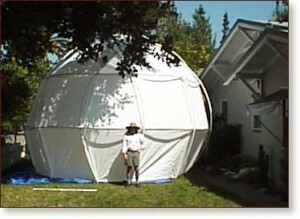 This one from www.shelter-systems.com is a great way to get a different type of geodesic dome or greenhouse. 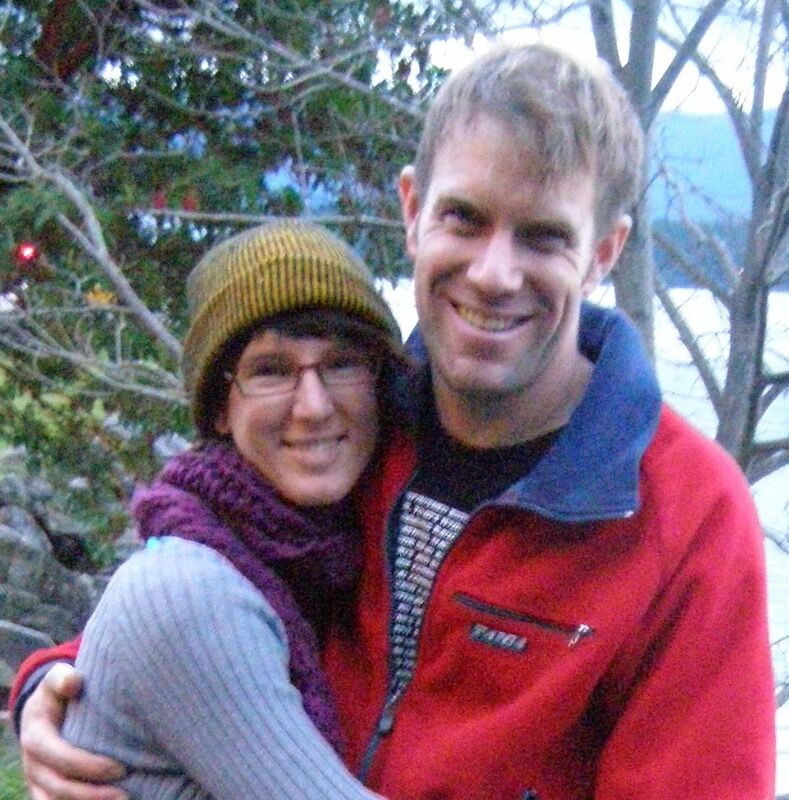 This dome pictured above is really a temporary structure rather than a biodome or greenhouse. The company does offer other domes of various sizes that do work as “geodesic” greenhouses even though they are not really a geodesic structure; rather they are called geotensic by the manufacturer. 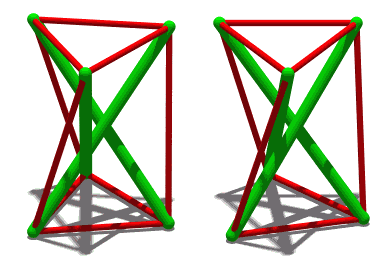 Tensegrity, tensional integrity or floating compression, is a structural principle based on the use of isolated components in compression inside a net of continuous tension, in such a way that the compressed members (usually bars or struts) do not touch each other and the pre-stressed tensioned members (usually cables or tendons) delineate the system spatially. So what the folks over at Shelter systems have done is make a free standing geotensic structure that comes in two small packages and assembles in a few minutes to make a free standing geometric dome that is held up by tension between the frame and the cover. 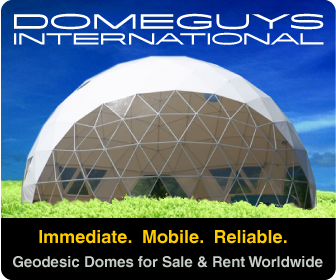 Shelter Systems’ domes are based on tensegrity and geodesic design principles. We call them Geotensic™. They have the highest strength-to-weight ratio than any dome tent made of the same materials, making Shelter Systems’ domes strong, durable, lightweight, and highly portable. Shelter Systems’ domes are so compact and lightweight we can ship even our largest 31′ dome with UPS to anywhere in the world. Shelter Systems’ domes gain their strength and simplicity and by combining tensegrity and geodesic design principles in their construction. 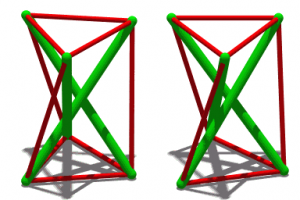 Our structures incorporate tensegrity by having the poles not attached to each other except by the tension of the covering (the poles will not stand on their own without the covering and fasteners). Our structures are geodesic because the shape of the covering and that most of the poles follow the shortest line on a sphere. Geotensic™ structures make possible the greatest strength to weight possible in a self-supporting shelter. 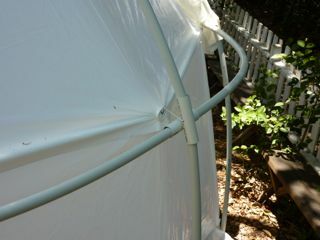 So all this adds up to another great option for a backyard biodome greenhouse especially if you need to move often or prefer to have a biodome greenhouse that is portable, quick to set up and will last three full years (according to the manufacturer) in full sun. 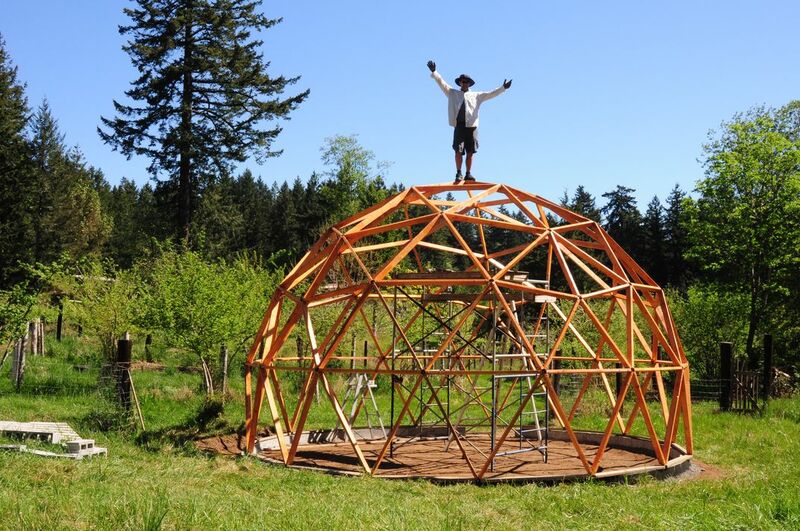 Obviously if you are serious about building your own geodesic greenhouse for long term food production you would go with something more permanent. 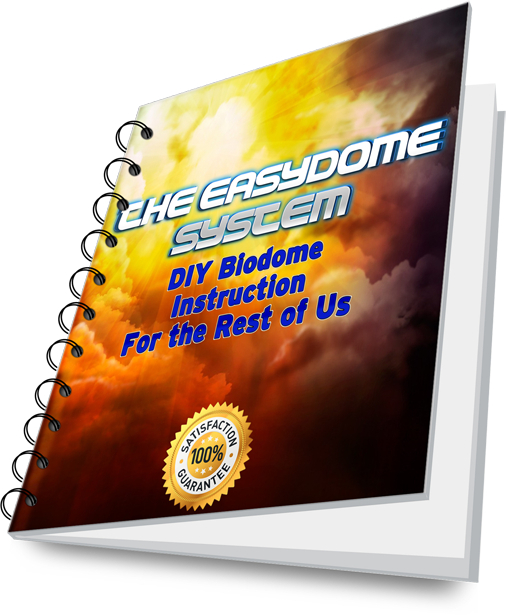 Something like the Eden Biodome System (see review here) which teaches even a complete novice to build their own backyard biodome and become food secure.